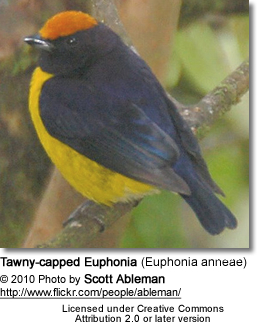 The Tawny-capped Euphonias (Euphonia anneae) - also known as Tawny-crowned Euphonias - are finches that occur naturally in the Central American countries of Costa Rica and Panama, south to Colombia in South America. 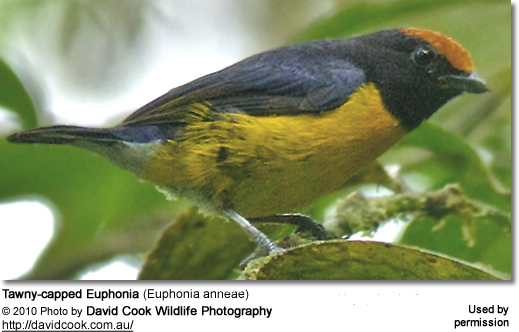 Their primary habitats are subtropical or tropical moist lowland forests, montanes, and heavily degraded former forests. Range: The northern race occurs in the Caribbean foothills from Costa Rica east to western Panama (Volcán de Chiriquí). 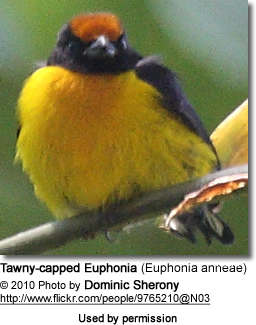 Range: The southern race is found on both slopes in Panama - from Veraguas east to extreme northwestern Colombia (area of Cerro Tacarcuna, in foothills west of Gulf of Urabá). Czech: Libohlásek hnedokorunkatý, libohlásek hn?dokorunkatý ...Danish: Brunisset Skoveuphonia ... Dutch: Bruinkaporganist ... Finnish: Rusolakkimarjukka ... French: Euphone à tête brune, Organiste à couronne rousse ... German: Braunscheitelorganist, Braunscheitel-Organist ... Italian: Eufonia capofulvo, Eufonia corona fulva ... Japanese: chaboushisumirefuukinchou ... Norwegian: Rustkroneeufonia ... Polish: organka rudolbista, organka rudo?bista ... Russian: ?????????????? ??????? 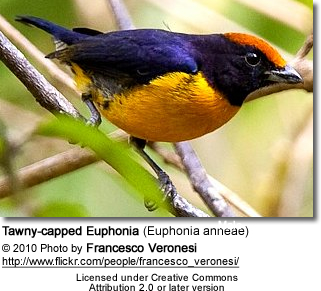 ... Slovak: organista okrovohlavý ... Spanish: Eufonia Cabecirrufa, Eufonia Coronirrufa, Eufonia gorricanela, Fruterito de Capa Castaña ... Swedish: Brunkronad eufonia ... Chinese: ??? ?